Unlike marmalade, when I dedicate a whole week to filling up the larder with umpteen jars of bitter orange deliciousness, I don’t make a lot of jam. I don’t eat much of it so worry that it’ll go mouldy before I get round to finishing a batch’s worth. However, when you’ve tasted a spoonful of fresh jam you realize that commercial preserves can’t hold a candle to the homemade stuff. 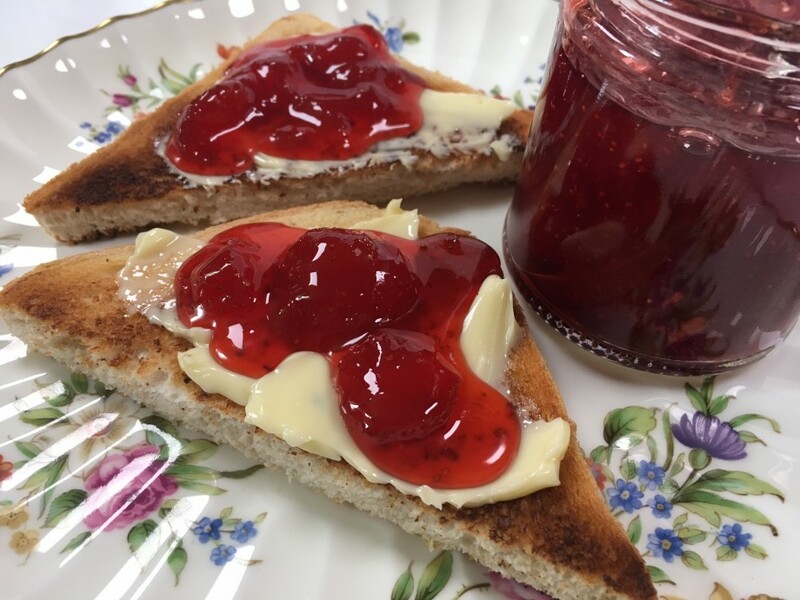 I use some jam sugar and lemon juice to ensure a set but you’ll still find it slightly runnier than commercial varieties. Start 24 hours in advance as you need to soak the fruit and sugar overnight. 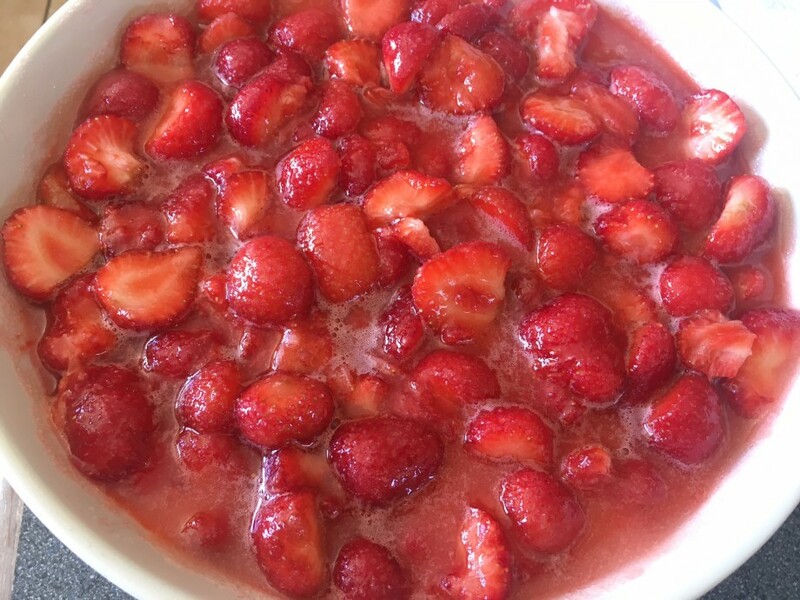 Put the strawberries, sugars and lemon juice in a very large bowl and mix together. Cover and leave overnight in the fridge. The next day, put a small plate in the fridge (this is to test for a set). Tip the contents of the mixing bowl into a large preserving pan (don’t try and make the jam in anything smaller) and stir over a low heat until the sugar has dissolved. Turn the heat up and boil for about 8-10 minutes until a sugar thermometer reads 105˚c. Skim off any foamy scum.Turn off the heat and test for a set. Put a spoonful of the jam onto the cold plate and leave for 3 minutes. 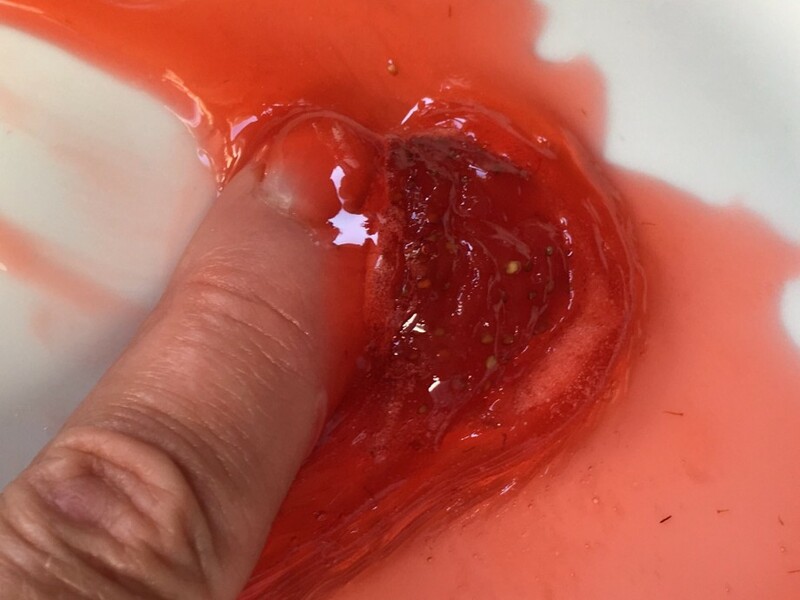 If the jam wrinkles when pushed with your finger it is set. If it is still liquid bring the jam back to the boil and boil for 2 minutes. Test for a set again. Leave the jam to settle for 15 minutes then stir to distribute the fruit. Spoon into sterilised jars, cover with a disc of wax paper and seal.